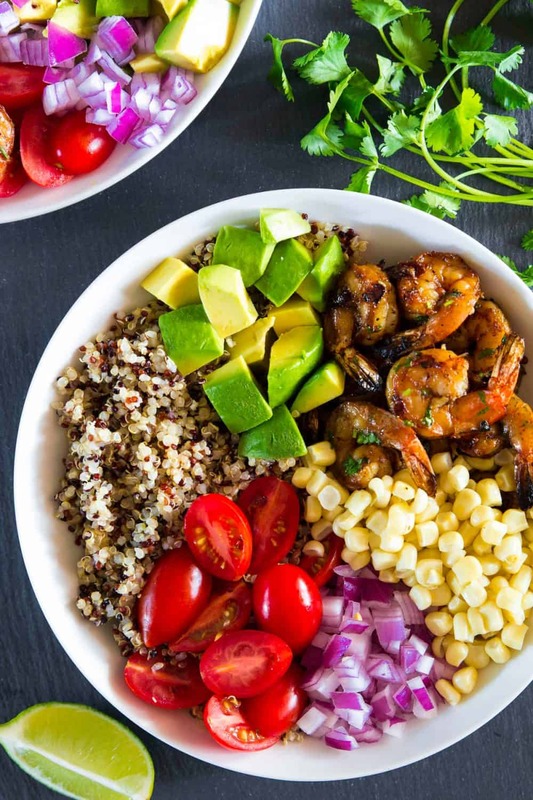 Making this Shrimp Quinoa Bowl for lunches is one of my favorite ways to get healthy food into my menu. Check out this simple and delicious recipe below. Tip: For a different flavor profile that is equally delicious, add our Garlic Ginger Shrimp to this bowl instead! This recipe was originally posted June 28, 2017, we’ve tweaked it a bit since then. This post may contain affiliate links. Read my disclosure policy here. Let’s talk about these delicious quinoa shrimp bowls. It’s the ultimate summer dinner/lunch. 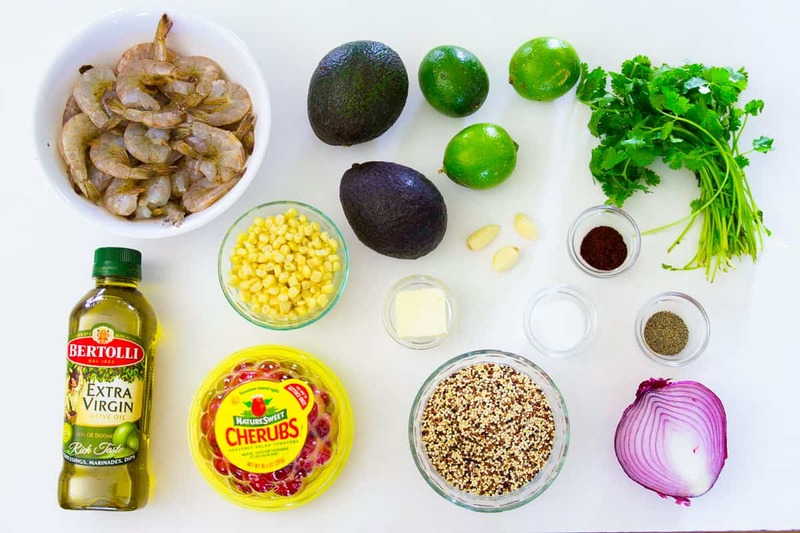 The shrimp are flavored in a cilantro lime marinade and grilled to smoky perfection. Once you have the shrimp done, it’s all about personal preference. 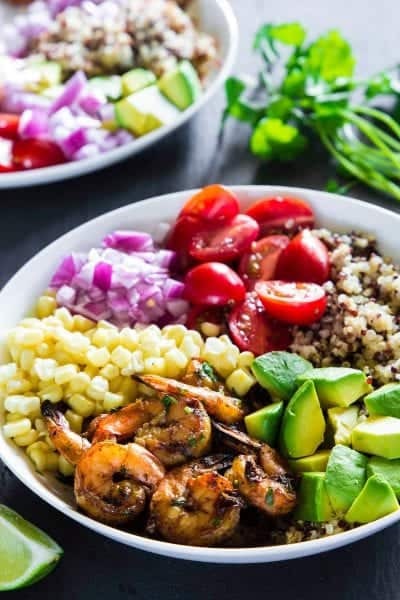 Assemble your bowl with your desired amount of avocado, cherry tomatoes, corn, red onion, quinoa, and grilled shrimp. Drizzle cilantro lime dressing over the top and that’s it. This recipe has quickly become a huge hit with my family. We cannot get enough of it! Marinate and cook shrimp as directed. While shrimp is cooking, prepare the quinoa and veggies you want in your bowl. I used avocado, corn, red onion, and tomato. Drizzle with cilantro lime dressing. Fresh cilantro is a must for this delicious combination. You can even add a bit of kick with some diced jalapeno if you like added spice. I love using shrimp in my meal plan. It’s so versatile and easy to cook. Plus it is a perfect lean protein. 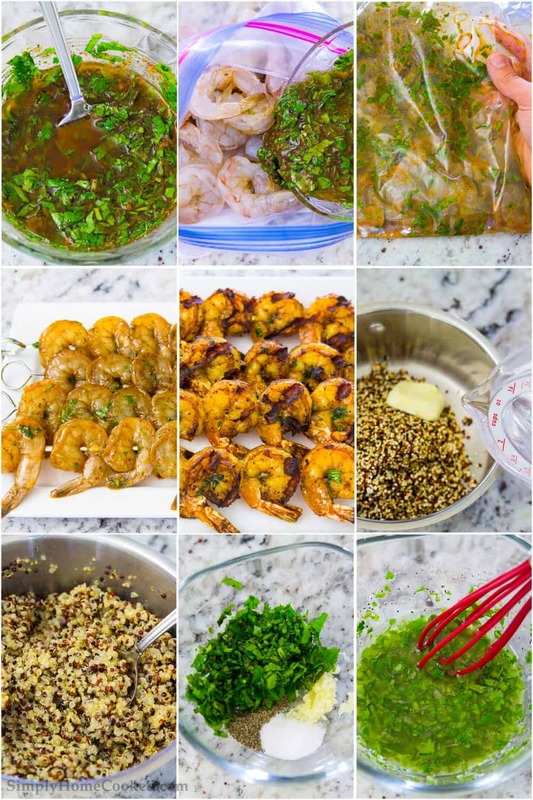 Check out more of my favorite shrimp recipes listed below. To make the marinade combine 1/4 cup olive oil, 2 grated garlic cloves, 1/2 cup chopped cilantro, zest of 1 lime, juice of 1 lime, 1 tsp chili powder, 1/4 tsp black pepper, and 1/4 tsp salt. Place the shrimp into a large zip lock bag and pour the marinade over the shrimp. Close the bag tightly and shake it around to to evenly coat the shrimp. Place in the refrigerator for at least 1 hour or overnight. Meanwhile make the dressing by combining 2 tbsp olive oil, juice of 1 lime, 1/3 cup cilantro, 1/4 tsp black pepper, 1/2 tsp salt or to taste, and 1 grated garlic clove. Then set aside. Make the quinoa by adding 2 cups water, 1 tbsp butter, and 1 cup (rinsed) uncooked quinoa in a saucepan. Bring it to a boil the cover and bring the heat down to low. Cook until all the liquid is absorbed (about 15 minutes). Place the marinated shrimp on wooden or metal skewers. Grease the grill and cook the shrimp on high for about 4 minutes per side. Assemble your bowl by placing your desired amount of chopped avocado, cherry tomatoes, corn, red onion, quinoa, and grilled shrimp. Then drizzle generously with dressing. These look so good. What would you recommend substituting the cilantro for? My husband will not eat anything with cilantro in it. Thank you Valentina! Cilantro has a very distinct flavor so it’s hard to find anything to substitute it with. I think it’s better to just omit the cilantro completely.